THERE were 99,427 homes sales recorded in the first three months of 2016, up 9.8% on the same period last year, according to latest figures from the Property Registrars. 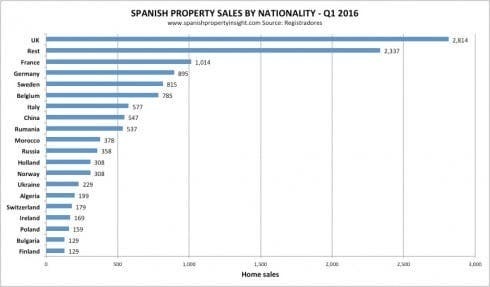 Locals bought 86,571 homes, up 8.9%, and foreigners bought 12,856 homes, up 16.4%. As a result, foreign demand accounted for 12.9% of the market in the first quarter, down from 14.4% in 2015’s last quarter, but up from 8.6% the start of 2013. 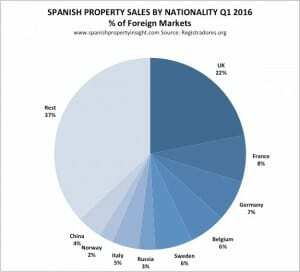 Once again the British were by far the biggest group of foreign buyers of Spanish property with 2,814 purchases registered in the period and 22% of foreign market share, followed by the French with 1,014 acquisitions and 8% foreign market share. Looking at just the biggest markets, British demand increased the most year-on-year, up 44%, followed by Sweden, up 34%, and China up 18%. Russian demand once again posted the biggest decline, down 35%. 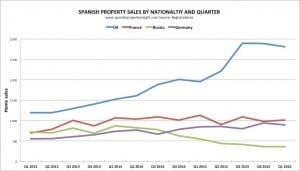 Both the biggest market, and one of the fastest growing, the British dominate the foreign market for property in Spain. The chart pictured, focusing on four key markets since Q1 2013, illustrates how British demand has taken off in recent years, whilst France and Germany increased only slightly, and Russian demand collapsed. 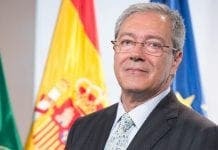 Despite the impressive growth of demand from the UK, the recent fall in the Pound against the Euro, and fears of a Brexit result in the forthcoming June 23 UK referendum on EU membership, led me to speculate that British demand for property in Spain might decline noticeably in the first two quarters of this year, at least until the referendum is out of the way. But there is no evidence of a softening of British demand in these figures. However, it’s worth bearing in mind that these figures from the registrars lag the market by a month or two, which is the time it takes for sales to be recorded in the property register. 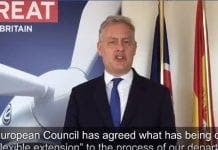 If indeed there has been a downturn in British demand in the first quarter, the second quarter’s results might be more revealing. And as the next chart shows, British demand as recorded in these figures follows the strength of the pound with a time lag of around six months. With the red line diving down (pound weakening against the euro), it’s not unreasonable to expect the blue columns (home purchases by Brits) to follow suit in the next two or three quarters, based on past performance. No?